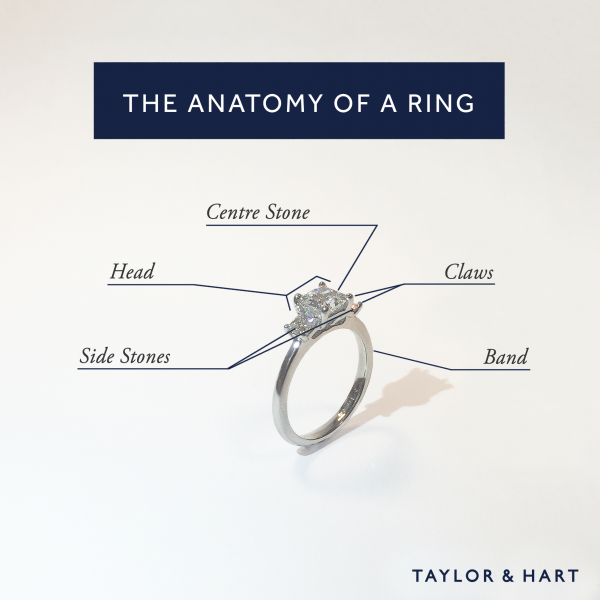 The style of a halo engagement ring allows customers to purchase a smaller centre diamond while the ‘halo’ effect of the surrounding diamonds gives the effect of a larger centre stone. 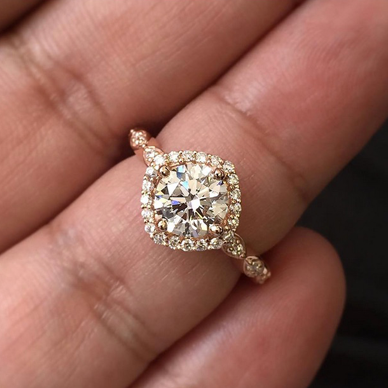 There are many creative ways in which you can modify a classic halo engagement ring to create a unique and stunning ring. 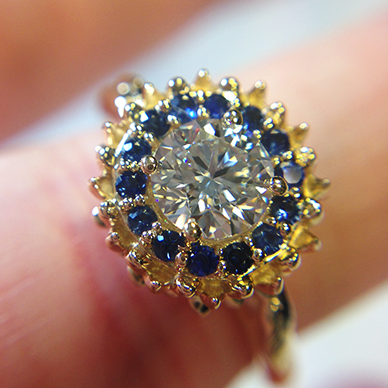 This halo engagement ring celebrates the use of colour through the two-tone white and yellow gold and the deep blue cushion cut sapphire set in the centre. The halo diamonds almost serve as flower petals and a touch of milgrain around the edge creates a vintage feel to the overall ring. One of my favourites is this halo engagement ring show below. Rotated at a 45-degree angle, the diamond halo takes on the shape of a cushion, framing the round brilliant centre diamond. The colourless diamonds are set in a rose gold setting, creating a stunning contrast between the icy white and warm blush tones. Why settle for just one halo when you can have two? The double halo engagement ring shown below uses a combination of colours and metals to achieve this visually impressive piece. 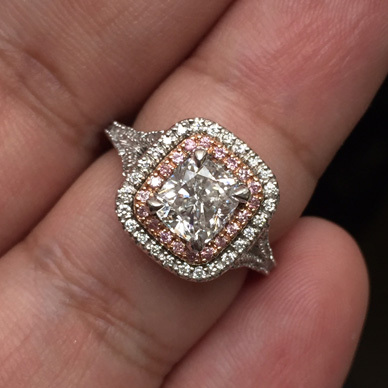 The majority of the ring setting is made in platinum while the central halo with fancy-intense-pink diamonds is in rose gold, to accentuate the pink hues. To finish this clean, linear design, four eagle claws hold the rectangular cushion-cut diamond in place. Some of our customers, especially those who prefer a more vintage-inspired design, have chosen to create halo engagement rings that frame the centre stone in a not-so-traditional way. Finally, this halo engagement ring below shows how a metal, like yellow gold, can look modern with a unique, floral inspired design. 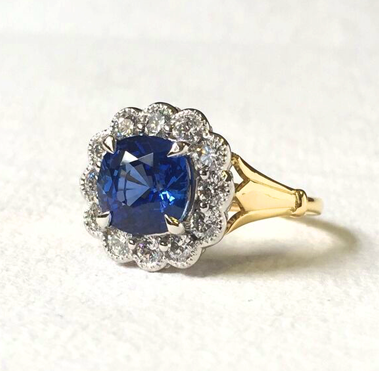 Classic engagement ring elements including a round centre diamond, blue sapphires and yellow gold, have been merged with an inspired floral theme and intricate petal details, to craft this distinctive halo engagement ring. 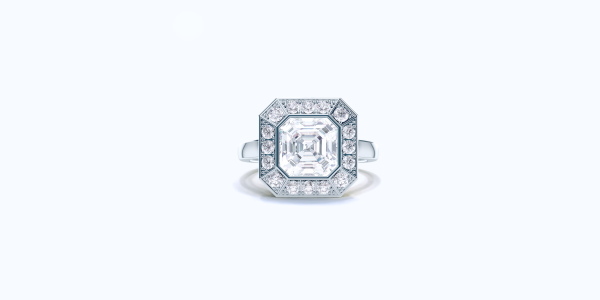 Having made its debut in the 1920s for its Art Deco design elements, the halo engagement ring has made a recent resurgence, making it the second most popular engagement ring style behind the classic solitaire. Offering a stylish and visually impressive twist on solitaire rings, it’s plain to see why so many people are opting for a halo engagement ring.